To date, 99% of all pulsars that have been discovered are located within the Milky Way and its globular clusters, while the remaining 1% are in the nearby Magellanic Clouds. Recent developments in observing technology at the Arecibo telescope now make detection of pulsars beyond the Magellanic Clouds a promising possibility. One excellent target to search is the spiral galaxy M33, the Triangulum Galaxy. M33 is only about 15-20 times more distant than the Magellanic Clouds and it is the third largest galaxy in the Local Group. Past efforts to detect pulsars in M33 with Arecibo have been unsuccessful (e.g., McLaughlin & Cordes 2003 and Bhat et al. 2011), but we have proposed a new and improved search. Our leading motivation for this project is to make a groundbreaking discovery of extragalactic radio pulsars in M33. This would help us better understand neutron star formation, supernova processes, and pulsar evolution during early stages in another spiral galaxy. 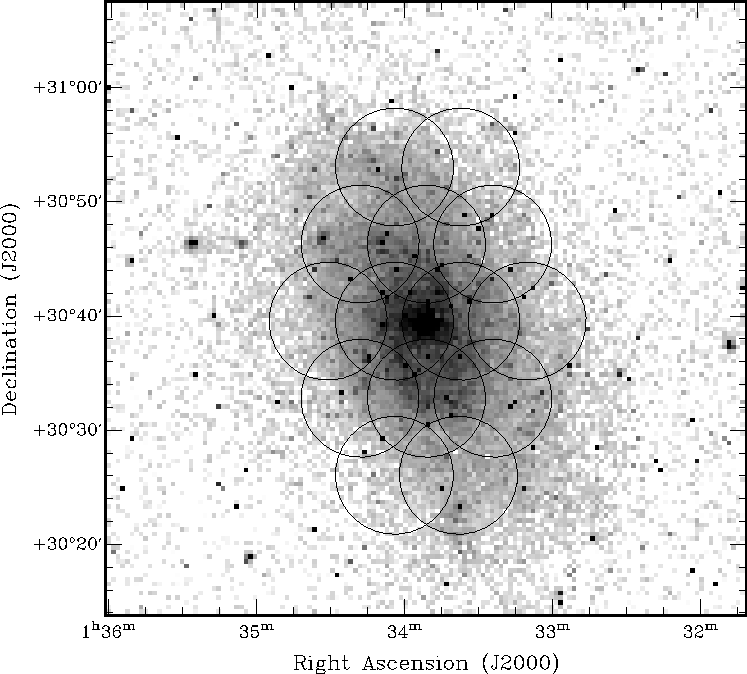 Pulsars in M33 could also be used to probe the local intergalactic medium. Apart from bright pulsars, our search may be sensitive to bright bursts from other sources, such as rotating radio transients and magnetars. It is also sensitive to the extremely luminous extragalactic bursts (fast radio bursts, or FRBs) that have been observed previously in some pulsar surveys. The origin of these bursts remains unknown. Using the Crab pulsar as a guide, we estimate that our observations using the PUPPI backend at Arecibo at a center frequency of 327 MHz ought to be sensitive to every Crab-like pulsar residing in the optical disk of M33 that is beaming in our direction. This work is funded in part by the Sigma Xi Grants-in-Aid of Research Program. 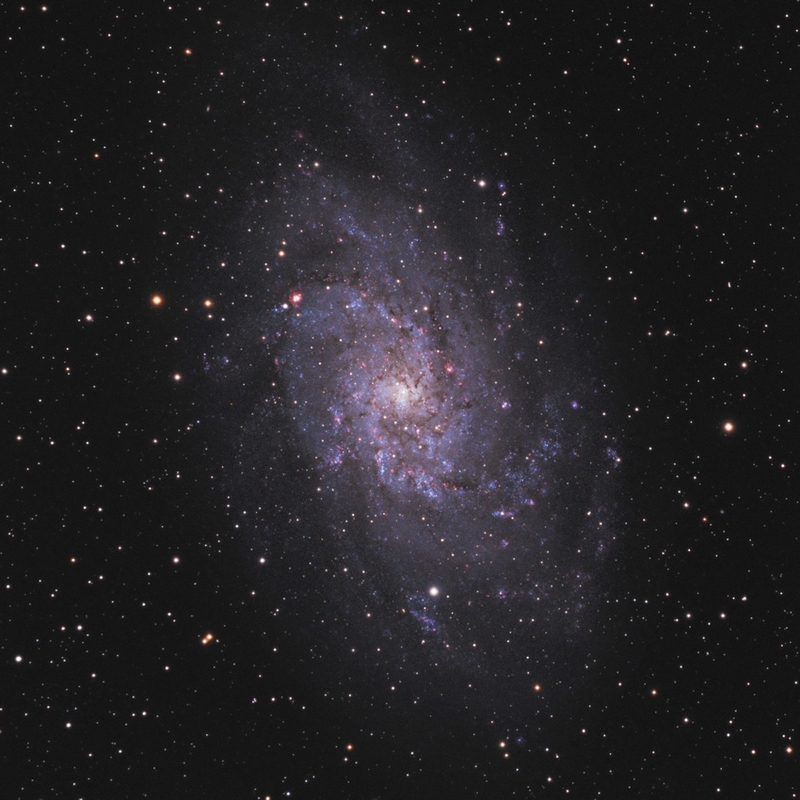 Below: (left) Optical image of M33, the Triangulum Galaxy, and (right) M33 with survey beams overlaid.